Mr. LB was grumbling and grumbling about runny store-bought eggs. but a mink got into the coop. Let's just say I really don't like mink. Gloves and stoles are justified. the fort clucks of chicken coops. that made cute little peeping noises. are making a mess in the shop bathroom. Cost: boards $15 and wire $25=$40 so far. I had measurements worked out so I didn't use more than 25 ft. I actually don't like chicken wire. It's difficult to work with and small critters can still get through it. The hardware cloth is sturdier and easier to work with. I made the box a little shy of 6.5 ft. long and 2 ft. tall. I wrapped the outer "walls" with the wire stapling it in place. Then 2 widths across the top one end. These old trim boards were here when we moved in about 15 years ago. One of those things that I knew would someday come in handy. you could also use pallet boards just as easily. We also have a plethora of screws in various sizes. Because these are thinner boards, I did pre-drill the holes. I know it takes a little longer, but then the boards don't split. For the "nest box," I used a scrap of plywood and another trim board. Again this is something that could be done with pallet wood. By the end of last weekend, this is as far as I had it. Today, got a few things finished up. I put a handle on the door which cost about $2. That brings our total to $42. I think we have a little latch out in the shop. If I can't find one and have to buy one, that might add another $2. Mr. LB made the brackets for the wheels. The wheels are more of those saved items. before they ever got their very own 'new' bikes. I kept the wheels and disposed of the rest. you might ask if they have bikes come in to snag one. is knowing what sorts of things are useful for your lifestyle. we usually end up being okay with the "cluttery" items we keep. We would probably have no idea what is useful when living a different lifestyle. but it would be covered with tin. We ended up with a sheet of tin for free. so the good metal isn't damaged. There is nothing wrong with this piece. It's simply a different color from the building metal. For this project, we weren't picky and obviously the price was right. That was probably so I will something to do tomorrow. so I can lift it while moving it. Since it drags, I don't want it jarred and twisted. Looking forward to fresh eggs and a clean shop bathroom. how lovely to have some little chicks and loving their 2 storey home it will be a while I suppose before they are pld enough to produce eggs, will you be naming them? Typically I just call the pick picks. They all look alike though they are developing personalities. Your chickens are going to love this! It's the Rolls-Royce of chicken coops. So cute, you did a wonderful job and your 'girls' will love it. Hope you have lots of eggs this fall. We have not had chickens in a while. We have tossed the idea around of getting laying chickens again. If we do, we want to use a chicken tractor. That's a nice tractor. We are so hilly and rocky that I can't have one that will sit flat to the ground. I am glad you'll be enjoying fresh eggs in the near future. You folks are so kind. I am going to make this just as soon as it stops raining. Love it. Such a great idea! you two are SO clever! I like your design & easy directions. But please tell how you keep the digging predators out? Perfect! We have been looking for a mobile chook run for 3 little fluff balls that Mumma hen hatched us 3 weeks ago until they are big enough to be with the flock. 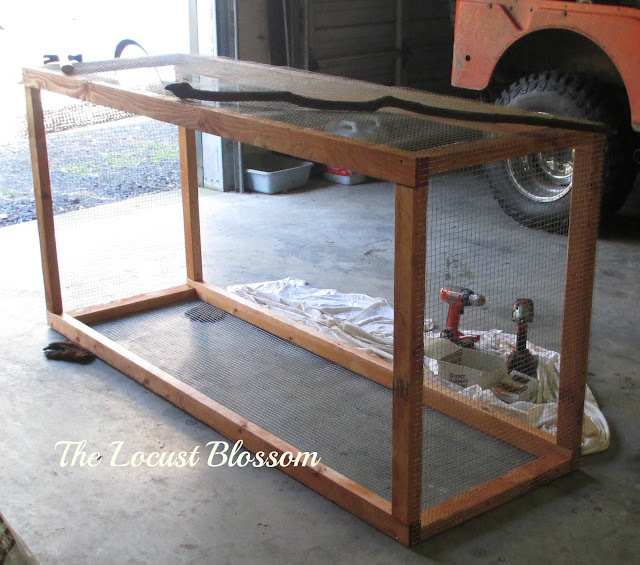 How do you keep the chickens from getting loose when you move the coop?